Answer: The Sun, all the other stars you can see in the sky, and a whole lot more you can’t see, are members of a vast family of stars located in a gigantic disc-shaped structure known as the Milky Way Galaxy. Not all galaxies are shaped like discs. Some are ellipsoid, some irregular, some almost linear. But we reside in a disc, comprised of some 100 billion stars, and with a diameter of about 100,000 light years. Our Sun is located around 2/3 of the way out from its center to its edge. As a result of this disc shape, we see more stars when we look in some directions, and less when we look in others. When we see the Milky Way in our sky, we are viewing our galaxy from the inside. What appears as a band of light is simply all those directions in which we see more stars. What lies beyond the disc of the Milky Way? Lots of empty space … for at least a few million light years. At that distance we begin to see other galaxies beyond our own, and there are millions of them spreading out as far as the most powerful telescopes can reach. 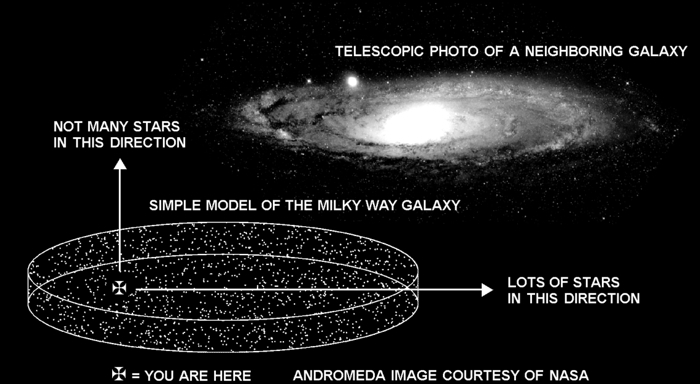 The image above shows our nearest neighbor galaxy, Andromeda, which has a shape similar to our own Milky Way.